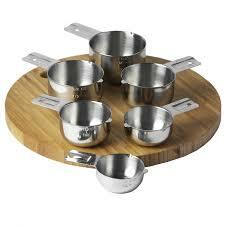 These are top quality measuring cups for your kitchen. Nicely weighted and made of stainless steel, these nestable measuring cups are nicely balanced and do not “topple” like some cups can when empty. With slightly grooved handles and fractional measurements on the side of the cup, there’s no need to pull out different cups when you need slightly different measurements. These are so nice, we’ve included them into our Kitchen Essentials shop. 100% Lifetime Money-Back Guarantee and you get a free baking eBook with your purchase which includes 25 recipes.